GOSHEN, N.Y. (March 16, 2018) – On Friday, March 9, Glen Arden celebrated local history by hosting a reading and discussion of the book Sarah, An American Pioneer: The Circumstantial and Documented Evidence of the Courageous Life of Sarah Wells Bull. A capacity audience of more than 80 people filled the Rhinebeck Room at Glenn Arden to hear local author Julie Boyd Cole and contributor Sarah Brownell discuss their work, which focuses on the life and accomplishments of Sarah Wells Bull, whose family figures prominently in Orange County history and is still active in our community today. The book chronicles the life of a true American pioneer, Sarah Wells Bull, from her early days as an orphan and indentured apprentice in what was then a new settlement called Manhattan. The story follows Sarah along her perilous journey up the Hudson River on a single mast sloop and into Orange County, where she settled 100 acres in the year 1712. Sarah was the first white woman to do so on the Wawayanda Patent. 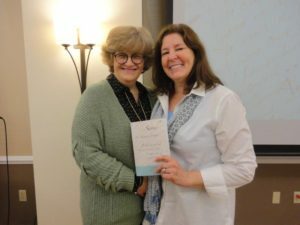 Authors – Julie Boyd Cole on the left and Sarah Brownell on the RightCole, a descendant of Wells, based the book in part on stories passed down from Wells herself to her grandson. Mary Jane Sorrell, a Glen Arden resident who happens to be Brownell’s mother and Cole’s aunt, addressed the audience to introduce the co-authors. The reading and discussion was followed by a book signing. Two guests, Dorothy Marshall and Micki Tetler, also won complimentary copies of the book. 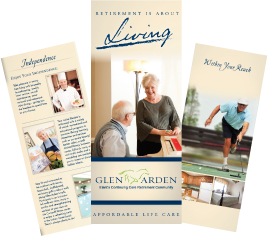 The author event was part of Glen Arden’s ongoing series of entertainment, educational and social events for residents and their guests.